Â£2000 Is available to help fund recording activity for the 2019-2020 year. The grants are awarded to support work that improves the quality, quantity or coverage of voluntary recording in the North East. Flexigraze Equipment and training for volunteers to survey plants on sites grazed by Flexigraze livestock. Lanchester Wildlife Group Equiment to assist Lanchester Wildlife Group in collecting more data for wildlife in the local area. 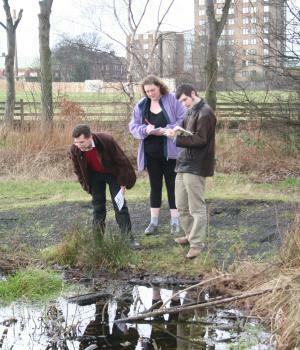 Otter Network Support to train volunteers to carry out the Annual Otter survey. Tees Rivers Trust Assistance with costs to train volunteers to survey for Elvers (young eels) on the River Tees. Please telephone Paul Stevens on 01912085158 or email paul.stevens@twmuseums.org.uk if you have any queries or would like to have a chat about your project ideas for the next round of funding which closes on 31st Jan 2019. "The funding you supplied set the group up with 3 GPS handsets that would enable full coverage of the whole reserve, recording the positions of setts and badger activity. The reference points of all sets to date have now been recorded and can be shared when disturbances or concerns are detected. The effective survey work, monitoring and protection are ongoing. A full set of results, badger numbers, locations and activities of the work done to date are ready to be forwarded to ERIC NE very shortly. What has emerged is a clear picture of habitats and activity for the length of the reserve which will be monitored and future changes/additions recorded. "As the Garden Moth Scheme Coordinator for the North East England, in 2013 and 2014, I loaned my old moth trap to friends, who wanted to try trapping moths. At the end of the year, one of these friends decided to buy his own trap and continue trapping. I advertised the availability of two loan traps and was pleased to receive four applications. Stephen and Helen, the recipients of the trap built with the ERIC grant, were successful in completing the 2015 GMS. As result, the Northumberland County Moth Recorder now has 433 records of 2077 individual moths covering 144 species that he would not otherwise have had, thanks to the small grant scheme from ERIC North East. As a result of advertising the loan traps in the autumn of 2015, a kind lady donated most of a third trap to the GMS. No bad thing as I have six applications to borrow a trap in 2016. As long as the traps survive, they will be loaned to a different recipient each year. In my limited experience, more than half of the recipients will end up buying or making their own trap. The true legacy of the ERIC small grant will be the increase in the number of people recording moths in North East England and the corresponding increase in the number of records." "Wylam Community Orchard is in the grounds of Wylam First School on a beautiful south-facing site overlooking the Tyne Valley. Since 2011 volunteers have planted 80 fruit trees and created a wildflower meadow beneath them. We wanted to survey butterflies, day-flying moths and bats on the site. This requires expert knowledge and we have been fortunate to have help from Butterfly Conservation North-East and the Northumberland Bat Group to conduct surveys over the last two years. ERIC small grant funding has facilitated this work. We hope that the resulting data will show increasing biodiversity year on year as the meadow and trees mature. We are very grateful to ERIC for its support." "Friends of the Brierdene required additional equipment for use by volunteers and schools, to survey the Brierdene Burn and to carry out its hoverfly survey. The small grant allowed us to purchase two lightweight sweep nets for collecting and recording hoverflies, and a pond dipping net. The survey work was carried out throughout the year by our regular volunteers, Duke of Edinburgh students who were working with us and visiting schools. The equipment was also used every Saturday during our Summer Holiday Nature Hour in the Brierdene. No previous survey work had been done on Hoverflies in the Brierdene. 10 surveys were carried out at various times throughout the year and a total 15 different species of Hoverflies were recorded. The survey work in the Brierdene Burn allowed us to confirm the species that were known to be in the burn, and to record a new species a Water Cricket which had not been in the dene before seen before. The equipment purchase though the small grant will continue to be used in in survey work and to monitor the life in the Brierdene Burn as well as supplying Records to ERIC NE."